NEW YORK ( TheStreet) -- Stocks closed down sharply on Monday as political gridlock on U.S. deficit cuts raised a new set of concerns for Wall Street. Losses were mitigated late in the session when Sen. Max Baucus (D., Mont. ), chairman of the Senate Finance Committee, stoked hopes the congressional super committee would be able to reach a compromise but that possibility proved fleeting as the committee issued a statement after the close claiming an agreement was "not possible." Skepticism that an agreement would be reached ruled the day, although ongoing European debt contagion fears also added to the market's edginess. The committee's failure now has investors worried about the potential for more damage to the U.S.'s credit rating or the confidence of consumers and businesses being shook at a time when the slow recovery in the U.S. economy remains fragile. 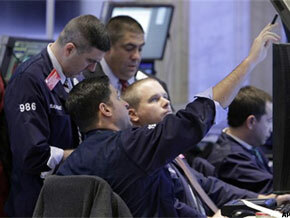 The Dow Jones Industrial Average dropped 249 points, or 2.1%, to finish at 11,547. Its session low was 11,454. The weakest blue-chip performers were Bank of America ( BAC, Walt Disney Company ( DISand Hewlett-Packard ( HPQ. In corporate news, Gilead Sciences ( GILD agreed to buy Pharmasset ( VRUS in a deal worth $11 billion. The transaction price of $137 a share in cash is an 89% premium to Pharmasset's closing price Friday of $72.67. Pharmasset jumped 84.6%. Insurance company Alleghany ( Y is buying Transatlantic Holdings ( TRH for $3.4 billion. Under the deal, Transatlantic shareholders will receive a per share amount of $14.22 in cash and 0.145 Alleghany shares for a total value of $59.79 a share. The deal will help Transatlantic ward off rival Validus Holdings ( VR, which has launched a hostile bid for Transatlantic. Shares of Transatlantic rose 0.8%. Western Digital ( WDC, the Irvine, Calif.-based producer of computer-storage technology, said an arbitrator in Minnesota has ruled against the company in a dispute with Seagate Technology ( STX, and awarded Seagate $525 million plus interest. Western Digital shares were up 0.3%. Pfizer ( PFE lost 2.9%. The drug company will pay more than $60 million to settle federal probes into whether it paid bribes to win business outside the U.S., according to The Wall Street Journal. The settlements are expected to be made public by the end of the year, according to sources in the report. Dow component Hewlett-Packard ( HPQ reported above-consensus earnings for its fiscal fourth quarter after the close but reined in expectations for fiscal 2012, and the stock fell in after-hours action. The report iss the first since Meg Whitman took over as CEO. Meat processing company Tyson Foods ( TSN reported fourth-quarter earnings of 26 cents a share, sharply lower than last year's earnings of 57 cents a share, and below the average analyst estimate of 32 cents a share. Shares ended flat.